Rating: 4/5 – Solid Exploration of the Hellraiser Universe. by ComicSpectrum reviewer Shawn Hoklas. When BOOM! Studios acquired the license to Hellraiser, they also got the creator of the material to come along with it. Clive Barker, who wrote the book the Hellhound Heart, and directed the first Hellraiser movie has returned to writing one of his most popular creations with Pinhead and the Cenobites in a new ongoing series from BOOM!. In addition, BOOM! has launched an anthology title taking place in the Hellraiser Universe titled Hellraiser: Bestiary. This first issue tells three different stories, each with it’s own creative team. Symphony in Red – Written by Ben Meares and Mark Miller, tells the tale of a frustrated, almost human in his emotions, Pinhead. As he takes out his frustrations in hell we see a side of Pinhead that we’ve rarely ever seen. The art by Conor Nolan fails a bit in it’s ability to make the cenobites look creepy and frightening, but his colors makes up for it with dark tones and heavy use of shadows giving hell itself that dark and depressing feel. It’s the weakest of the three stories, but still an entertaining read. Desert Fathers – The art by Colin Lorimer really stands out in this eight page story about a small community that is shaken up by the appearance of the mysterious puzzle box. Lorimer does a great job of showing emotions in his characters and making the monster in the story look imposing on page. It’s heavy on the violence, and Lorimer choreographs the story so well incorporating that violence in a way that makes sense. The story in terms of overall enjoyment is better than the first, but in this issue, they definitely saved the best for last. The Hunted, Part One – In a story that will continue on into next issue, the same writers of the first story tell the opening chapter of what happens when a small group of hunters attempt to capture Pinhead, in order to remove the pins from his head. A fantastic opening that unfortunately leaves you hanging on a cliffhanger. At just six pages it’s the strongest of the bunch, but ends too soon. I would have loved to read more of this story, but am happy that it’ll continue on into next issue. And the art by Carlos Mango who has a similar line to Matthew Clarke, makes the story stand out even more with his detailed line. 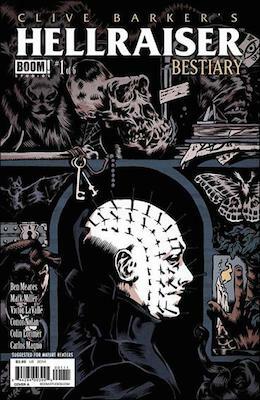 If you’re a fan of Hellraiser don’t ignore this series just because it’s an anthology, there’s quite a bit to enjoy. The Hellraiser universe has a lot of characters, settings and concepts to explore so to see them being examined in an anthology title similar to those from the E.C. or Warren days is exciting. Hellraiser has been in good hands since BOOM! started publishing it, and they’re proving that “they have such sights to show us”. This entry was posted in Boom! and tagged Boom! Studios, Cenobite, comic book, comics, Hellraiser, Pinhead. Bookmark the permalink.